Placebo Junkies was a wild ride in book form! Audie lives her life as a human guinea pig for pharmaceutical drug trials. To say that it’s a roller coaster way of living would be an understatement. From one day to the next, Audie and her friends never know what pill they’re going to get served or what side effect they’ll be dealing with. Audie decides to go all in with the medical testing in order to save money for a trip with her boyfriend, Dylan. Time is running out, because Dylan’s cancer has come back with a vengeance and Audie doesn’t know how much time she has left with him. As she begins to hit more and more drug trials with her friend Charlotte, they both become sicker and sicker. This is the type of book where you think you’ve got a handle on the plot, and then, ever so slightly, the narrative tilts and you’re left wondering what’s going on. J.C. Carleson’s grasp on her story is so masterful and subtle; that it isn’t until looking back you see all the breadcrumbs she’s left for her readers. Audie is one of the best unreliable narrators I’ve come across, and the conviction with which she tells her story is admirable. It wasn’t until the very end of the book that I knew what was truly going on and I relished the story’s ability to keep me in suspense for so long. This book deals with some heavy themes and therefore I would recommend it to mature audiences only. The idea of moral conviction paired with personal gain was a particularly interesting discussion throughout, and one that isn’t resolved by the end of the novel, but not for lack of trying. Young love, domestic abuse, medical abuse, and consent all become highly discussed topics and highlight the complexity and pain that comes from growing up amidst various forms of abuse. Placebo Junkies is a highly fascinating read with troubled characters, and surprising twists that keep you on the edge of your seat. If you’re looking for a twisted thriller with a unique premise, look no further! This book is captivating, unique, devastating, heartbreaking, and utterly brilliant. I couldn't put it down. The heroine has such a vivid, interesting voice, and the premise is fascinating. But what really takes this book into 5 star territory are the twists and turns. The heroine becomes an increasingly unreliable narrator, and things stop adding up, and the reader is left grasping for a reality that no longer seems to exist. I couldn't stay ahead of it, and in the end, this book ruined me for other books for days. Raw, funny, honest, and devastating. I couldn't put it down. I absolutely loved this book. Audie made her trials so real, it was if I was there with her getting pricked by the nurse who could careless. This book made my heart ache, you really could feel how Audie and her friends wanted to be something in this world. They gave everything (literally) just so that can survive. This book truly shows how some give all to do what they want in life. Between the heartache and the physical pain that they felt, it really brings you into their lives. Great writing style, perfect characters that you fall in love with, and the want to join them in their journey. It has never taken me this long to read a book before. 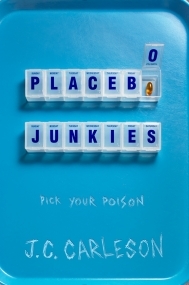 Usually, I read a book within one or two days, but, my experience reading Placebo Junkies is as unique as the story. This brilliantly written novel explores many different themes such as morals, medical ethics, mental illnesses, addiction, human subject testing and control. That one word, control, is essentially what Placebo Junkies is about. Audie and her friends make a living by becoming “human guinea pigs” not because of necessity but, rather because they have the control of when they work, how much they make, and how much damage these tests are going to have on their bodies. They don’t care about helping discover new drugs to cure diseases, in fact, Audie and Charlotte conspire together to abuse the system and make the most money possible. I was disgusted reading about how people and especially these characters will do anything for money. It’s because of this reason that it took me so long to read Placebo Junkies. When I was reading there was a point in the story were I thought ” this can’t be real, people can’t actually do this to themselves” but, there are people who participate in human subject testing. This is all very real. Overall, I did not like Placebo Junkies. I disliked all of the characters, especially Audie. Her only motivation in life was getting money so she could go on vacation with her boyfriend. I don’t like reading about people who don’t respect themselves or others and are driven by greed. The plot twist at the end will shed a little bit more light on Audie and her behavior but, it doesn’t make her a more like-able character. I gave this book three stars was because of the plot. It discusses a very important topic that society often tends to overlook. After reading Placebo Junkies I will now wonder who had to be a “guinea pig” to put this medicine/drug on the market today? YA needs more books like this, where it changes your perspective and provokes discussion. I think that everyone should read Placebo Junkies.